It’s October in New England and fall is in the air. Along with cool crisp days, Sunday football and falling leaves stands an important tradition: the Golf Performance Center Championship. To help the talented AJGA field prepare, The Hub enlisted two of our very own ‘big hitters’ to compile a list of inside tips to navigate tricky Redding C.C. 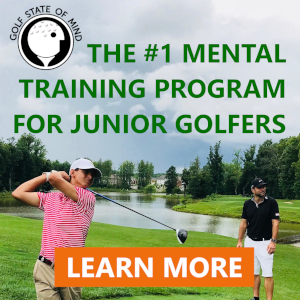 Our list of tips comes from Roger Knick, Class A PGA professional, founder of Junior Golf Hub and the northeast’s leading golf academy, Golf Performance Center and Rick Dowling, former collegiate golfer and assistant coach at Fairfield University and 2017 CT Amateur Champion. Redding is a very different type of golf course – no one has shot under par for the last few years. The grounds crew at Redding CC mows half the fairway away from the tee (down grain) and half the fairway towards the tee (into the grain). Aim for the down grain part of the fairway. Why? Two reasons. Tee shots roll out more in the down grain section and approach shots are easier to spin and control. Not bad! So, find the fairway…the down grain part of the fairway – if you can! Buyer beware: multiple greens feature severe slopes. Do your due diligence! Holes 1,6,10,12,13,15,17,18 feature a drastic slope in some portion of the green. Leaving yourself on the wrong side of these slopes will not be good for your score! Chart and map the greens carefully during the practice round. Redding is not a bomber’s golf course, and favors well-placed tee shots and careful approach shots. Hole 12 only measures 478 yards from the back tees, but it is not your traditional par-5. Going for this green in two can be risky. Hit the straightest long club in your bag off the tee (minimum 210 yards), followed by a layup shot to the top of the hill. This will leave you about a 100-yard wedge shot and a great chance to make birdie. The 7th tee box aims you in the right rough(20 yards off center). Commit to a proper line off the tee, ideally left center and make sure you’re lined-up comfortably. Missing this fairway right will force you to navigate a large tree guarding the green. If you hit it way right on #2, no problem. Missing the fairway way right on 2 will put you in the right rough on #7 and it will be open to the green. Much better than missing it left or slightly right (in the fairway bunker). Hole #8 is a tricky little par-3 measuring only 165 yards from the back tees, but it plays significantly downhill. Get comfortable with the yardage it’s playing during your practice round. When the tournament rounds start, be sure to keep an eye on the conditions and how they may be affecting ball flight, as this may alter your club selection. 18 features a semi-blind tee shot. Your aim point should be the space between two trees in line with the short game area. Test it out during the practice round. Split the gap on 18 and finish strong!